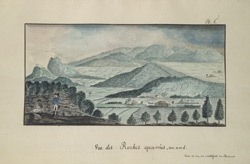 Sketch of the Square Rocks mountain range on the island of Martinique, drawn by Alexandre Moreau de Jonnès, an officer in the French navy. The sketch illustrates the mountainous nature of Martinique's landscape. Between the mountains are areas of savannah which could be used to grow crops. In the foreground of the picture 2 men are depicted, one points to the valley, in which can be seen dwelling houses and works buildings, the other appears to be reading a newspaper.